One taste and you’ll see what an amazing flavor combination peaches and barley make in this authentic Macedonian village dish. A touch of honey (or agave), a bit of orange juice, a dash of cardamom, a few sprigs of fresh mint and a pinch of cinnamon make this simple recipe so delightful it will quickly become a favorite. Greek cooking often calls for roasting or baking fruits in the oven and baking your peaches is key to this dish. The high oven temperatures with baking intensify the natural sweetness of the fruit. Baked peaches are a perfect example of this. 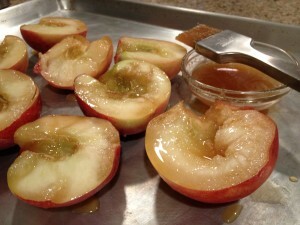 To bake your peaches, cut the peaches in half, remove the stones (pits) and arrange on a sheet pan skin side down. Lightly brush the fruit with an equal parts honey (or agave)/orange juice mixture and bake at 400 degrees for 20-30 minutes until they are fork tender. Once the baked peaches are cool, gently remove the skins. Chop the peeled fruit into small bite sized pieces and set aside. If you are doing this step more than 2 hours ahead of time, squeeze a bit of fresh lemon juice into the chopped peaches and keep them refrigerated to prevent them from browning. When cooking your barley for this recipe, use plain water here and not vegetable stock as I often recommend with savory barley recipes. Add a pinch of salt to the water along with the barley and bring them to a boil. Lower the heat and cover, cooking the barley on VERY low heat for 45 minutes. A cup of uncooked barley makes approximately 3 1/2 cups of cooked barley. While the barley is cooking, gently warm 3 tsps of honey (or agave), 3 tbsp of orange juice and a half tsp of both cardamom and cinnamon until mixture becomes a thin liquid. Once the barley is fully cooked and still very warm, transfer barley to a large bowl and immediately add the honey (agave) mixture. Stir well, making sure to cover every grain. The warm barley will soak up the liquid like little flavor sponges. 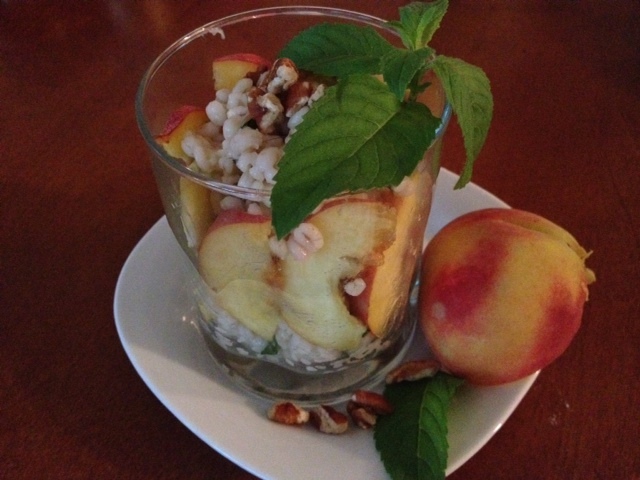 When the sweetened barley has cooled, add the chopped peaches and fresh mint. Stir gently to combine. I like to refrigerate for a couple of hours before eating to let the flavors intensify and come together but its delicious right away too! Preheat the oven to 400 degrees. Wash, halve and remove stones (pits) from peaches. Arrange peaches skin side down on a baking sheet and lightly brush the tops with a mixture of equal parts honey (or agave) and orange juice. Bake uncovered for 20-30 minutes until fork tender. When cool enough to handle, gently remove the skins and chop into bite sized pieces. Set aside. While peaches are baking, bring barley, salt and water to a boil. Lower heat and cover, cooking on VERY low heat for 45 minutes until tender. Warm 3 tsp honey (or agave), 3 tbsp orange juice, cardamom and cinnamon together over very low heat until a thin liquid and set aside. 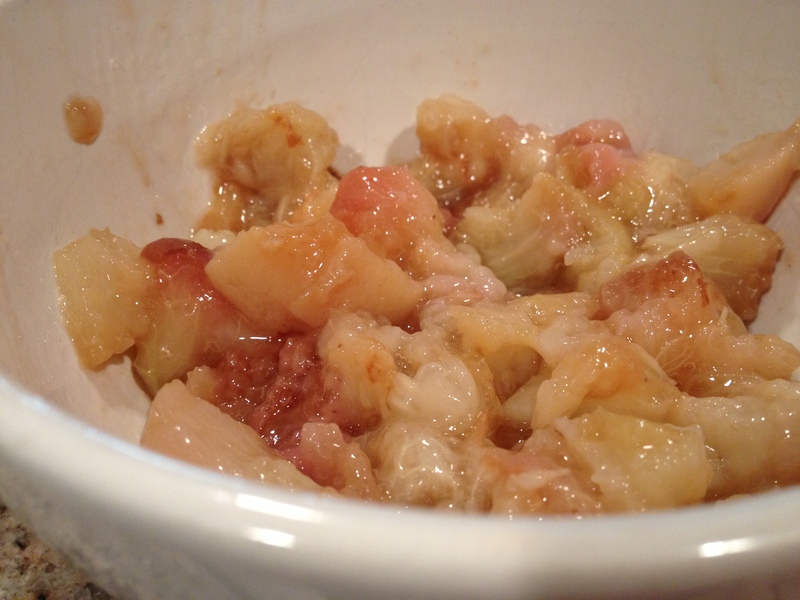 If you like a sweeter finished dish, you can add up to a tbsp of white sugar to dissolve in the warm honey mixture. Once barley is cooked, remove from heat and, while still hot, transfer to large mixing bowl. 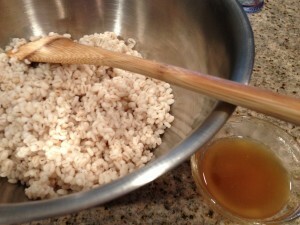 Immediately add the honey (agave), orange juice, spice mixture to hot barley and combine completely. Allow sweetened barley mixture to cool and add chopped peaches and chopped mint. Mix well (and gently) until completely combined. Refrigerate for 1-2 hours before serving. Garnish with sliced peaches, toasted pecans and/or golden raisins. 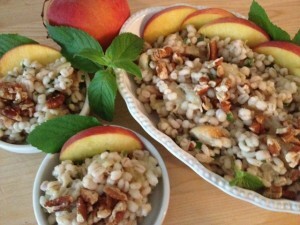 Peach barley is perfect for breakfast, lunch or desert and a favorite with children. I hope you enjoy this as much as I do. Kali orexi!